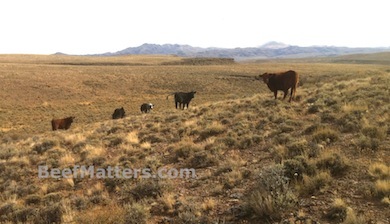 In the late fall after gathering the cattle and bringing them off the mountain, we spend a lot of time re-riding. We are always a few head short when we arrive at the fall or winter range. Phone calls are made to neighbors inquiring if they have seen any of our lost yearlings. Cowboys drive around hoping to spot a yearling or two. My husband was turning off water in the pipelines when he found these six yearlings. A couple of days later he took one of our cowboys, loaded up their horses and went after the yearlings. 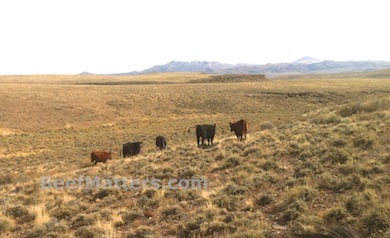 Apparently these heifers were quite content all by themselves on the mountain, because they were not happy to discover two cowboys riding up to them. It took a little convincing, but they eventually ended up at the corral and were loaded into the trailer. Upon their arrival at ranch headquarters, they were preg checked, vaccinated and reunited with the rest of the yearling heifers. Re-riding is a tedious job for some cowboys and others consider it one of their favorite assignments. Either way, it happens year after year. Rarely do we gather yearlings off of the mountain and not miss at least one or two. We have learned over the years that when a neighbor asks if we have all of our cattle gathered that the correct answer is never “Yes”.